Over the course of the last year we were working hard on establishing an experimental publishing outlet for the Hybrid Publishing Lab. As our first publication is finally completed we are happy to introduce meson press to you. Run by members of the lab the aim of meson press is to publish high quality Open Access monographs. Even though the scholarly book is changing its face in the age of digital media, we strongly believe in the many virtues of its format for academic communication. Some might claim that the book is dead. Nevertheless we are aiming to reinvent the book by developing creative solutions for scholarly publishing in the digital age. 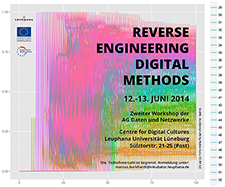 meson press publishes research on digital cultures and networked media. Its publications challenge contemporary theories and advance key debates in the humanities today. Today our first book will be released: Our friends of the Gamification Lab at the Centre for Digital Cultures of Leuphana University of Lüneburg have put together a formidable volume of articles that seek to rethink gamification. The book offers a candid assessment of the current gamification hype by tracing back its historical roots as well as exploring novel design practices and methods. The contributions to “Rethinking Gamification” (edited by Mathias Fuchs, Sonia Fizek, Paolo Ruffino and Niklas Schrape) furthermore critically discuss the social implications of this phenomenon and present artistic tactics for resistance. Read the full publication here. It’s open access! Join us on Monday, June 30th, 2014, at 7 p.m. for the official book release of “Rethinking Gamification” at Mond­ba­sis (Lüner­tor­s­traße 20, Lüne­burg, Germany). Let’s talk about Gamification, future books to come, and upcoming topics. And last, but not least, let’s celebrate. Following the great example of the Austrian Science Fund the Swiss National Research Foundation will fund the publication of Open Access monographs beginning on July 1st. Apparently this forthcoming shift from granting printing subsidies to supporting digital editions was not received positively by many stakeholders in the Swiss scientific community as Caspar Hirschi discusses in his thoughtful NZZ article. However, creating funding opportunities for publishing books in Open Access is an important step in the right direction. This leaves me wondering when the German Research Foundation and other research funding organizations in Germany will finally introduce similar funding instruments. Yet despite this progress, a worrying imbalance remains between the efforts of research funders (including organizations that perform research), which can act only at a local level, and big publishing houses, which act globally. As a result, countries and institutions have different OA policies and behaviours that form a confusing patchwork. Some have explicit OA policies; others do not. Some require; others recommend. Some offer funds to pay for OA costs; others do not. Some have opted for ‘gold’ OA, which demands that publishers make papers freely available; others prefer ‘green’ OA, which allows researchers to archive the work. This cannot be resolved on a national level according to Kratky. As a consequence he calls for Europe to take a leading role in the efforts to make publicly funded research outcomes available for free. The dispute amongst scholars and policy makers about which road to take to Open Access (gold or green) revolves to a great extend around the problem (or danger) of double dipping. It is widely acknowledged that publishers ought not to be allowed to charge twice for scientific publications, that is scholars and their public funders on the one hand and publicly funded libraries and readers on the other hand. On first glance this claim seems to be quite obvious as well as its solution appears to be trivial: when published open access a text has to be put online free of charge. Yet, that’s only part of the story. The revelation of Prism and Tempora caused an ongoing discussion about data, privacy and surveillance. Yet, considering for example the fuss about Big Data or the struggle for Open (Government) Data there is a need for a broader discourse on how to grasp a better understanding of our digital data culture. Therefore the working group on data and networks of the German Media Studies Association (GfM) convenes next week (July 26/27, 2013) for its first workshop in Cologne. Yuk Hui, Andreas Kirchner and me from the Hybrid Publishing Lab will be there to tackle together with the other participants the question “What is Data Critique?”. Registration is still open. So just stop by, if you happen to be around Cologne next weekend. All necessary information can be found here. Yesterday the German parliament passed a law granting scientists the right to make their research available online after a period of twelve month independent of former agreements with publishers. On first glance this appears to be a good thing. Yet as always the devil lies in the detail. The law excludes the regular everyday research done in universities. This limitation has been justly criticized. Moreover the legislation falls short in another respect which is especially important to the humanities: The legal right is limited to publications in periodicals. Scholarly monographs and papers in edited volumes therefore cannot be made legally available online after the embargo period. So it comes back to the question under which conditions book publishers allow authors to make their books Open Access. Heinz Pampel put together a great overview (in German) of the debates around the so-called ‘Zweitveröffentlichungsrecht’ on his blog wisspub.net.